Being the son of a career military soldier has its advantages. Firstly, one is exposed to many different environments. Secondly, one has a more worldly approach to life. Lastly, the foundation of a particular regiment and discipline is set. For FM Stephen Muhammad, destiny would fall upon his shoulders and he would learn the venerable war game of chess from his older brother, Timothy who had learned it from their father. Progress was swift as Muhammad vaulted over the expert level and began grappling with the finest American masters while living in California. In addition, Muhammad had developed a reputation as a fierce blitz player often giving time odds of 3:1. At one time, Muhammad had achieved an Internet Chess Club rating of 3049 (!) and was ranked highly in GM Walter Browne's World Blitz Chess Association. In the scope of his plans is to earn the IM title and ultimately the GM title, but most importantly to be a devoted Muslim striving to remain upright. Come meet Brother Muhammad! FM Stephen Muhammad at the 2002 Penn State Masters. Photo taken by Jerry Bibuld. "I believe my first tournament was at Tuskegee Institute University, my father taught Military Science there, so I was allowed to play even though I was in high school at the time. I did not win or anything and I don't remember my exact score, but I do remember coming away with a terrible headache! That is not where my love for chess began for sure." Muhammad's first rating was 1537 (provisional) and occurred at the Army qualifier at Ft. Meade, MD in 1981. Perhaps the staging ground for Muhammad's rapid improvement was the Santa Monica beach in Los Angeles, California where players gathered to "lock horns." Thereafter, Muhammad tasted success in a couple of U.S. tournaments, and was completely hooked. After consistent tournament success, he literally vaulted over Expert (2000-2199) and achieved his Master's rating in 1989. "My strongest inspiration during my developmental years would probably be Alexander Alekhine. The player who inspired me most among those to whom I had access would unquestionably be Emory Tate." Anyone who knows Stephen Muhammad will understand that he loves a challenge. He frequently organizes impromptu blitz tournaments in an instant. While in Los Angeles, he often invited players to his apartment. "My apartment served as the unofficial chess club for most of my stay there. Some weekends there might be anywhere from 2 to 8 players present," remarked Muhammad. Of course, one of the main activities was the blitz, or lightening chess… a game in which he is an absolute terror!! Muhammad has taken his amazing blitz skills to the Internet Chess Club (ICC) and under the name "phasor," has beaten the likes of GMs John Nunn, Zurab Azmaiparashvili, Maxim Dlugy, Alexij Dreev, Ulf Anderssen, and many others at the ICC. Muhammad has also had over-the-board success and has beaten GMs such as Johann Hjartarson, Eduard Gufeld, Walter Browne, Michael Rohde, Rosendo Carrean Balinas, and Semon Palatnik. One of the highlights of Muhammad's career has been his superb performance at the 1999 World Open. "My highest rating was 2460, I think that came from the World Open in 1997 where I defeated two GMs and an IM, drew with two GMs and was undefeated until my seventh-round loss to GM Vladimir Epishin. My performance for that event was 2647. The following year I defeated GM Alexander Goldin in the 8th round and was playing GM Alexander Shabalov in the last round for first place! Unfortunately, I did not win what would have been a history-making game." 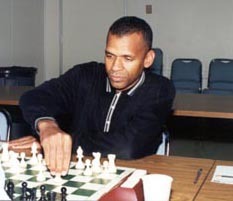 Another highlight of Muhammad's career was his victory and IM norm at the historic Wilbert Paige Paige Memorial Chess Tournament in the summer of 2001. Muhammad is popular as a trainer in both online and scholastic circles. According to one player, "He has the Internet training system down to a science." Does FM Muhammad offer any advice? "Tournament preparation is a must and should constitute every phase of the game; some players erroneously think opening preparation is sufficient. Opening preparation is important, but endgame analysis and exercises, along with deep middlegame analysis are essential." Every chess player has a figure or two having served as an inspiration to their development. It is interesting to note that while Muhammad prefers a slow buildup before attacking, all of his inspirations are fiercely tactical players such as Alexander Alekhine, Mikhail Tal and Garry Kasparov. "My strongest inspiration during my developmental years would probably be Alexander Alekhine. The player who inspired me most among those to whom I had access would unquestionably be Emory Tate. I never knew there were Black men exchanging blow for blow with top players until I flew to the east coast for the New York Open." As one of the strongest Black players in US history, FM Muhammad has goals set on the GM title. However, he has other goals and aspirations. Besides completing an Electrical Engineering degree at Auburn University (Alabama, USA), he enjoys computers, Reggae music, and reading non-fiction books. He hopes one day to start a family of his own and to continue trying to become an exemplary follower of The Honorable Elijah Muhammad.